This type of glass was manufactured in the early Nineteenth Century and was made by basically spinning molten glass on the end of a rod to form a flattened circular shape which was cut into rectangles when cooled. The glass varied in thickness from 1 to 2 millimetres and had the distortions and bulges evident today in many windows in old buildings. Whilst it is not possible to carry out the process mentioned today, we can produce a very similar product by a heat process on any glass to effect similar distortions and bulges creating the visual appeal of the Old Crown Glass. However, in addition to the Reproduction Crown Glass for single glazing, we have achieved a first by manufacturing Reproduction Crown Glass with curves and bulges and flat perimeter margins thereby enabling Reproduction Crown Glass to be used in the construction of a Slimlite Double Glazed Unit. This breakthrough concept for sash windows now makes it possible to achieve the old world visual aspect to windows much preferred by Heritage Associations but, most importantly, the double glazing helps to reduce Carbon Dioxide emissions. The increase of carbon dioxide emissions and their contribution to the "greenhouse effect" and global environment is of major concern. Increasing emphasis and effort is being placed on the reduction of these harmful emissions. 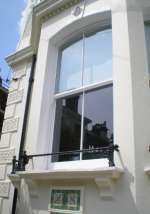 The energy saved when Slimlite Double Glazed Units are installed in the average house with single glazed sash windows will result in a reduction of carbon dioxide (C02) emissions of approximately ¼ tonne per season (October - March) (Energy Technology Support Group) (Emissions, Domestic Housing 27% = 63 million tonnes). Condensation is the enemy of timber sash windows and the main cause of astragal and bottom sash decay. The warm air in a house during the day absorbs moisture from various sources, mainly in the kitchen and bathroom. If the temperature in the house drops sufficiently during the night, the air can no longer hold the moisture absorbed at the warmer temperatures, so deposits the surplus on the coldest surfaces - single glazed windows which are practically the same temperature as the air outside. Double glazing effectively has an inner pane which is warmer than the outer pane and therefore helps to maintain the room temperature when the heating is switched off at night. The inner pane being warm but not as warm as the walls, will still cause convection where air against the glass will flow downwards, but at a much slower rate than a single glass thereby helping to reduce condensation and heat loss. Single glazing in a house can only keep out the wind and rain, provide daylight and provide vision to the outside. It has no insulation value, and is a major contribution to temperature drops when heating is not maintained. Condensation is a fairly complex problem and apart from heating variables can be reduced by ventilation and air changes, forced or natural.